wade college blog – Page 2 – Creative. Attentive. Inspiring. 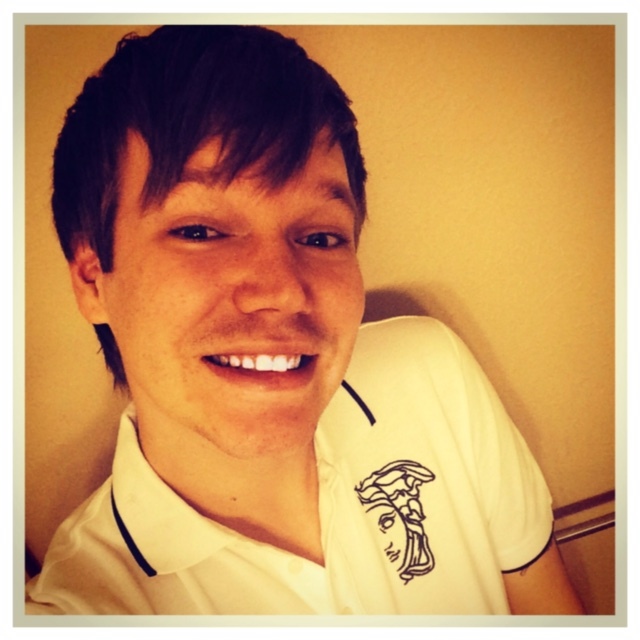 Billy Crawford, 2013 BA-Merchandise Management Alumni and Merchandise Assistant of Pier 1 Imports Inc. headquartered in Fort Worth, TX, shares his experiences as a student at Wade College and about his career in the industry. 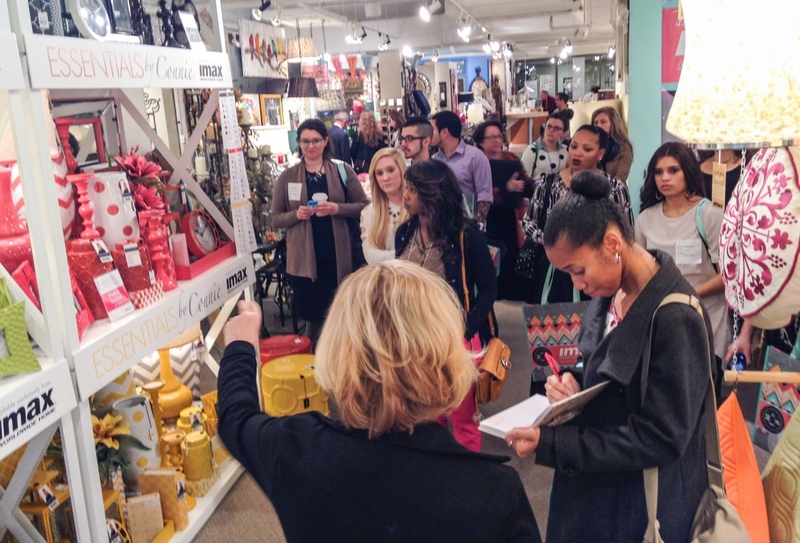 What are your primary responsibilities as a Merchandise Assistant? A typical day at the office can vary. Many days will involve writing new order forms for new product that has been decided to purchase. Re-buys also come through daily on SKUs that we carry year-round or on their low inventory. I assist 3 Buyers, 2 Merchandise Planners, and 2 Allocation Analysts over 5 different departments including rugs, bedding, throws, window treatments, and shower linens. One day may include a compliance meeting about flammability reports for bedding versus the next day we have a meeting on areas of opportunity for a solid program for outdoor rugs. There is daily involvement and communication with overseas vendors about purchase orders or characteristics about products. The thing that I enjoy most about my career thus far is the constant involvement with different types of work in the office. I work many different people and departments. I have worked with legal, product compliance, buying, planning and allocations, and marketing/e-commerce. It has showed me all the different occupations that really exist out there and helps you narrow down what really interests you. I chose Wade College because of the smaller campus size and the prime location in the Dallas Design District. Also, I was intrigued by how industry professionals taught many of the courses. Wade College significantly helped prepared me for my career by offering courses that relate to my current occupation. Many things that were learned in these courses are brought to the workplace! Do not study just to make a letter grade, study to remember! There is also a correlation between what I was taught in the classroom and with my current job role. Many of the tasks that I complete daily were discussed in multiple courses. I understand the merchandising jargon versus someone coming in with an accounting or business degree. Wade College helped prepare me for this industry! What advice do you have for students and recent graduates beginning their careers in your profession? The most precious advice that I can give involves what employers are looking for. Many students, (myself at the time) focus to make straight A’s and fail to realize that is only part of the “game.” Many employers are looking for candidates that are well-rounded. They want individuals that have experience, have stories to share, have accomplishments outside of the classroom. You might be the smartest student but that doesn’t make you the sharpest crayon in the box. Last but not least, you have to network! It is crucial in order to survive in these areas of concentration. My proudest accomplishment is acquiring a corporate level position in merchandising within 6 months of earning my Bachelor of Arts degree. My co-workers are definitely my inspiration. They have taught me not only to work hard, but how to be a better person and how to be optimistic in every situation. I definitely follow their leadership and I’m constantly intrigued by their perseverance. Wade College is very proud of you, Billy Crawford! Being a fashion merchandiser — isn’t that the ‘job’ that makes apparel look pretty on the mannequins in retail? Today, a merchandiser must be well versed in their own business’ protocol as well their competitors. A career in merchandising involves a concrete knowledge of the manufacturing process, and how to buy, promote, and ultimately sell fashion goods / services. Additionally, a fashion merchandiser knows great details about the textiles process, from fiber type to fabrication techniques best for any particular fabric. The necessary skill sets required for such a rewarding, fast paced career as a fashion merchandiser may be achieved by understanding trend forecasting, having an acute analytical ability, and being able to effectively communicate. While more scientific than fortune telling, fashion merchandising jobs do have a forecasting element. In order to improve your accuracy, you’ll need a thorough knowledge of past fashion trends and an awareness of current industry developments. A good sense of style obviously helps you; however, you must also determine how things fit into a budget and whether they meet the functional needs of consumers. Other criteria may also influence your fashion merchandising decisions, so you will need to be able to analyze a complex set of issues and stand behind your choices. From negotiating with manufacturers to getting your marketing message out to customers, there is ample opportunity to exercise your powers of communication in the fashion merchandising field (Description of Fashion, n.d.). Source: Description of Fashion Merchandising Jobs. (n.d.). All Art Schools. Last month, Wade College welcomed to the fall 2014 trimester a large, new group of first term students, as well as our continuing students. Wade College students quickly grow accustomed to a wide variety of industry opportunities at Wade College, beginning in their very first trimester. These opportunities range from one-day volunteer opportunities at industry events to short-term and long-term internships and paid work opportunities, to permanent placement in career-related, full-time positions with notable DFW-area companies. The start of a trimester can bring students anxiety from trying to find a job, whether it’s to help pay for school or to gain the necessary work experience to ready a resume for a full-time career in fashion, interior or graphic design. Career Services at Wade College gave students a jump-start with their job search by bringing employers on-campus through our fall 2014 job fair. 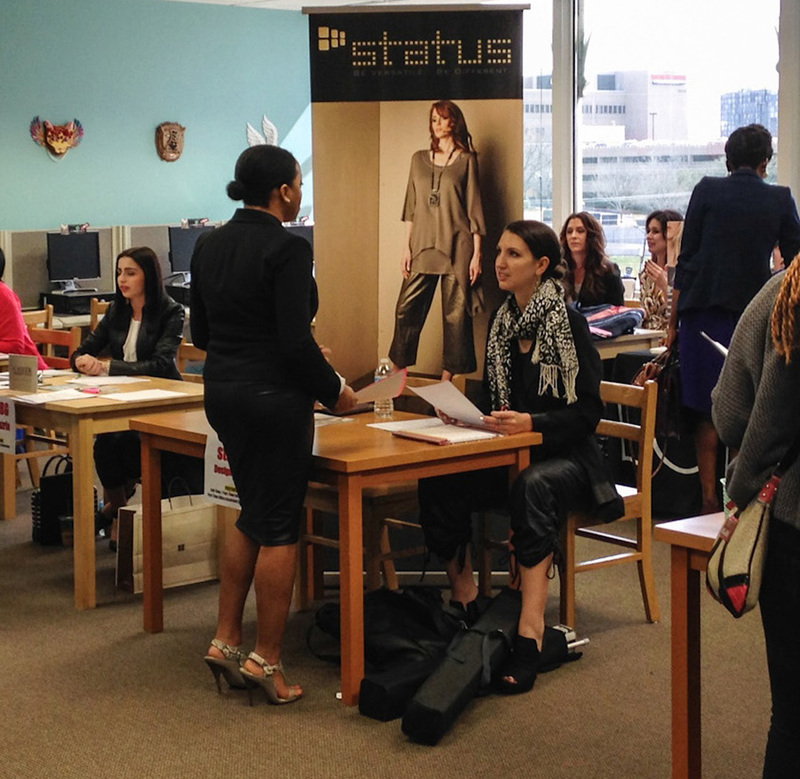 Employers and their representatives included Terry Costa, Dillard’s, Michael Kors, LOFT, The Army & Airforce Exchange, The Limited, Sunglass Hut, and ZURI Furniture. Job opportunities presented included part-time jobs, full-time jobs, and internships. Students from all levels and concentrations attended, dressed for success, with polished resumes in-hand. They had the opportunity to network with employers and learn about job opportunities that they each offered. Employers were impressed with the preparedness and professionalism of our students, each making a good first impression. Many students received scheduled interviews and, to top it all, several of them landed the JOB shortly after! Job fairs are a one-stop shop. They are part of the job search resources offered by the Career Services department for Wade College students to meet one-on-one with employers at one time and at a convenient location on-campus. All in all, it was a success, especially when students become employed in positions that not only help pay their bills, but also enable them to gain industry experience while pursuing their studies! We are fortunate to have such a stellar Career Services department with tremendous industry connections at Wade College! One of many resources Wade College offers for portfolio preparedness. If you are considering enrolling in an art or design school, most likely you will need to have a portfolio of work that you’ve done to show the admissions committee. Current students will also be asked to assemble portfolios of the work they have completed while in school. At the end of your program, your portfolio will be reviewed and assessed for completeness and creativity. At Wade College, Associate of Arts students do not need a portfolio for admission, but they are required to develop one while in school. A portfolio is required for those students enrolling in the Bachelor of Arts program. Associates degree program students participate in the Professional Portfolio Critique at the end of their fourth trimester. Students’ portfolios are first critiqued by faculty and then by an outside panel of industry professionals. Are you panicking yet? Don’t worry—Wade College offers an entire class that will teach you how to assemble and market your portfolio. Not only do you want your portfolio to shine for your end-of-program review, but it will also need to impress those potential employers! 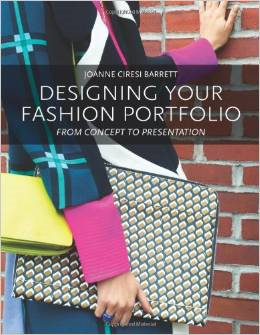 In addition to the Portfolio Planning and Design class, the Wade College library offers a number of books on planning and assembling your portfolio, whether you are a fashion design student, merchandising student, graphic design student, or interior design student. If you are not a Wade College student, check your local library or Amazon for these titles and help yourself create an amazing fashion design portfolio, merchandising portfolio, graphic design portfolio, or interior design portfolio.